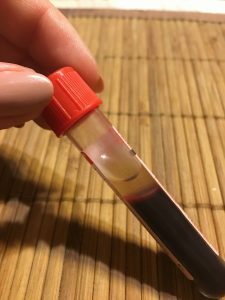 2018-09-20 – My blood test results show high ALT and AST. I had a liver biopsy and it shows congestion. Probably a result of eating McDonald’s, Taco Bell, and Pizza Hut every day of the week for 20 years. I have no symptoms and feel better than I have ever felt in my life. Shows mild chronic passive congestion. Moderate numbers of hemosiderin laden macrophages within hepatic sinusoids. Doctor says high liver enzymes may be a result of the herbal tea I drink. A month before my next blood test I will stop drinking herbal tea a switch to black and green decaf. I have also started purchasing refillable 3 gallon jugs of purified water instead of drinking filtered tap water just incase. I have decided to stop all doctor visits (except the ones for my Hypothyroidism) unless I actually feel bad. I have felt great these past few years and I don’t want to waste my time and money getting blood test after blood test just because some numbers don’t look right. Also I will not be getting a Flu Vaccine ever again after reading Dr. McDougall’s Newsletter – I Say “No” to Flu Vaccines and watching the Webinar 12/03/15, Vaccinations: What Should I do?. Went to the doctor’s office today for a thyroid test. They usually have trouble taking my blood. I have large arm veins but the blood doesn’t come out. So this time I brought a free weight with me and did some exercise right before the blood test. It warmed up my arms and they were able to take blood easily. The doctor said I have some jaundice on my face but my eyes are still white so she was not going to make a big deal about it. I think it is carotenosis because I eat a lot of carrots, sweet potato, dark leafy greens, and tomatoes everyday. I told her I would not be following up on my liver problem and that it was unnecessary to run a liver enzyme test because I feel great every day. So everything went well. This is the first time I have gone into the doctor’s office feeling good and walked out feeling good. It’s definately carotenosis because cronometer shows that I get about 70 mg to 100 mg of beta-carotene a day from plants and this is enough to change skin color. I’m not going to do anything about it in fact I’m going to eat more orange vegetables and fruits. I think it’s great that I am eating so healthy that I am glowing yellow. More info about beta-carotene below.